Personality | The "Gandhi of Cambodia"
Kuala Lumpur, Malaysia -- Bhante Maha Ghosananda was one of few Cambodian monks to survive the brutal purge instigated by Pol Pot and the Khmer Rouge. During the reign of the Khmer Rouge, he studied under numerous Buddhist masters from every tradition, and helped tend to the spiritual and material needs of the Cambodian refugee community. Following the fall of the Khmer Rouge, Maha Ghosananda became the leader of the gradually recovering Cambodian Sangha (his title is "Sangha raja", which is variously translated. "Supreme patriarch"). Maha Ghosananda was born in 1929 to a farming family in the Mekong Delta plains. From an early age he showed great interest in religion, and began to serve as a temple boy at age eight. He greatly impressed the monks with whom he served, and at fourteen received his parent's permission to ordain as a Buddhist monk (bhikkhu). He went on to study at monastic universities in Phnom Penh and Battambang, before going to India to pursue a doctorate in Pali at Nalanda University in Bihar. Before the age of 30, Ghosananda was granted the title "Maha" in recognition of his skill at the monastic Pali language exams. He went on to study under a variety of teachers, including the Japanese monk Nichidatsu Fujii and the Cambodian Patriarch Samdech Prah Sangha Raja Chuon Noth. 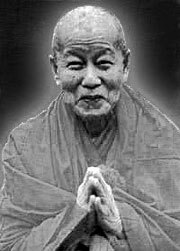 From Nichidatsu Fujii, Maha Ghosananda received training in mediation and nonviolent resistance (Fujii was an associate of Mahatma Gandhi), and by studying under the Cambodian Sangha Raja was marked as a rising star of the Cambodian monastic community. In 1965, Maha Ghosananda left Cambodia to study meditation under the Thai master Achaan Dhammadaro, a guiding light of the Thai Forest Tradition. Four years later, while he was still studying at Dhammadaro's forest monastery, the United States began bombing Cambodia as part of their attempt to shut down the Ho Chi Minh trail and end the Vietnam War. A year later, a full-blown civil war was underway in Cambodia. As the Khmer Rouge seized control of the country, the prospects for Buddhism in Cambodia became increasingly dim. Pol Pot, who once had served in a Buddhist monastery, identified the monks and temples as part of the power structure of feudal Cambodia that must be overthrown and destroyed. Furthermore, monks were considered to be part of the intellectual class, which was targeted for especially brutal treatment and "reeducation". As part of Pol Pot's horrific year zero campaign, monks were systematically turned out of monasteries and murdered or sent to "reeducation facilities" (which is to say, they were tortured, and then murdered). Some monks were forced to violate their vows (most often through forced copulation at gunpoint) so that they would not get any ideas about continuing to act as monks. By the time the Khmer Rouge ended its reign of terror, most Cambodian monks were dead, and most temples and monasteries were rubble. Meanwhile, Maha Ghosananda continued to study under the guidance of Achaan Dhammadaro for nine years. Though eager to attempt to help his people, he was advised by his teachers to wait for a better opportunity. Finally, in 1978, he saw an opportunity to help his people, as the first refugees from Pol Pot's coup and ensuing reign of terror began to arrive in Thailand. He traveled to Sakeo, on the Thai side of the Thai-Cambodian border, where Cambodian refugees were arriving in droves. Maha Ghosananda's appearance raised a stir among the refugees; to wear the robes of a monk in public was to invite a death sentence in Cambodia- most likely, none of the refugees had seen a monk in years. Maha Ghosananda began to distribute photocopies of Buddhist scripture among the refugees, and to revive their lapsed and battered religious practices. those they had displaced. His reception was much the same; amazement, followed by grateful weeping. In addition to handing out copies of the Metta Sutta and establishing new temples in refugee camps, Maha Ghosananda worked to bring about peace and reconciliation in his war-torn homeland. When Pol Pot's regime collapsed in 1979, Maha Ghosananda was one of only 3,000 Cambodian Buddhist monks alive- out of 60,000 at the start of his reign of terror in 1976. In 1988, he was elected Supreme Buddhist Patriarch of Cambodia (dhamma raja) by the Cambodian Sangha. In 1992, during the first year of the peace agreement, Maha Ghosananda led the first nation-wide Dhamma Yatra, a walk for peace across Cambodia. The Dhamma Yatra (Pali, 'yatra' journey or pilgrimage) is much more than an elaborate walk-a-thon. Every year, more than 200 marchers, many of them ordained Buddhist monks from a variety of traditions, travel the roads of Cambodia, praying for peace, blessing villagers and regional leaders, and drawing media attention to the numerous problems that plague post-war Cambodia- illegal logging, unexploded land mines, inadequate sanitation, the plight of the numerous war orphans, and the loss of Cambodian culture. The route that the Dhamma Yatra takes is far from a walk in the park. Every year, Maha Ghosananda and other organizers work to plan a route for the march, a route that is almost always guaranteed to carry the marchers into danger and uncertainty. In its second year, the marchers passed through contested territory just prior to the first U.N monitored elections, encouraging Cambodians to resist attempts at voting intimidation. During the next year, they passed through the most contested and war-torn areas of Cambodia, and two walkers were killed when they were caught in crossfire between government and rebel forces. In 1997, the path of the walk passed through areas that had been, until the previous few months, entirely under former Khmer Rouge hard-line control. The Dhamma Yatra marchers were sometimes first contact with the outside world that the people of this region had had in decades. Whatever the route taken, the Dhamma Yatra walkers are always received with great joy and appreciation by the Cambodian people. They have re-dedicated Buddhist temples damaged or desecrated during the war years, and are helping not only to improve the political and physical circumstances of the Cambodian people, but also to renew and revitalize Cambodian religion. 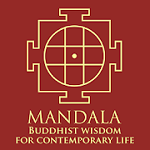 In 1994, Maha Ghosananda was nominated for the Nobel Peace Prize by the chair of the U.S Senate Foreign Relations Committee, Claiborne Pell. He was again nominated in 1995, 1996, and 1997 for his work in bringing peace and stability to Cambodia. In 1998, he received the Niwano Peace Prize in recognition of his commitment to peace and inter-religious understanding. He has also acted as an advisor to the Buddhist Peace Fellowship, and has been involved in campaigning for negotiations to end the civil war in Sri Lanka. In 1997, he staged the first mass coordinated mass event to protest the use of violence in Cambodian politics, following a coup d'etat, and was recognized with an award from Sri Lanka's Sarvodaya Srimadana organization. In Cambodia, it is said that Maha Ghosananda is a true monk, that he would give his daily meal and robes to anyone that asked for them. He is called "Cambodia's Gandhi", a "living treasure", and the "living Truth" (Dhamma). His commitment to peace and the people of Cambodia has persevered for his entire life, despite exile, great difficulty, and the loss of his entire family, as well as most of his teachers and friends.